Boneal Incorporated has been awarded a three-year, $28 million Third-Party Logistics (3PL) contract to provide support equipment for the USAF. Boneal’s Logistics Division will supply several hundred items to the Air Force. The items will be delivered to United States Air Force facilities worldwide and include things as diverse as munitions handling equipment, weapons maintenance equipment and safety/laboratory equipment. Boneal was chosen for this ground-breaking contract because of its strength in acquisition, supplier development, technical problem-solving and logistics management. “We are committed to performance excellence. Boneal will reduce the time airmen around the globe will have to wait for the equipment they need to do their jobs,” said David Ledford, President of Boneal. 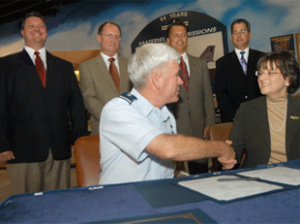 This USAF contract has five option years extending through 2014. Founded in 1980, Boneal is a prime-contractor to numerous government agencies and private industry and operates in Means, Kentucky. For additional information contact Boneal by phone at 606-768-3620.